Buyer beware of fads that have faded—not all fads make great collectibles or great investments. Many heirs today are surprised to learn how little a collection of limited editions is worth. Lesson: Don’t be taken in by either enormous or bargain prices. Here are seven once-popular collectibles that have little value now. The fig urines of children with sweet faces, based on the artwork of German nun, Sister Maria Innocentia Hummel, were first made in 1935 by W. Goebel Porzellanfabrik in Germany. They became popular in the U.S. after soldiers returning from World War II brought them home as gifts for Moms and Grandmothers. The original quantities made sold quickly and soon old figurines, identified by the mark, rose in price. More collectors were buying, more were made—eventually too many for collectors—and interest dropped. The secondary market for the figurines disappeared. 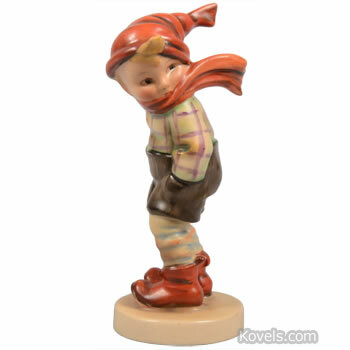 W. Goebel sold the rights to the figurines and Hummels are now made in Japan and sold to gift shops. There is a collector’s club with a newsletter and special small figurines for members. Old figurines are difficult to sell. Part of the most famous collection of Hummels was sold in Ohio in 2013, the rest to be sold in 2014. Twenty-nine pieces sold for over $2,000 each, including an international figurine depicting a girl wearing a Czechoslovakian costume that went for $5,000. Many sold for $20 to $100. In 1993, Ty Warner, Inc., later renamed Ty Inc., introduced a line of small bean bag animals called Beanie Babies. Each sold for $5 and had its name and “birthday” on an attached hang tag. They soon created a secondary market of their own. By 1995 Beanie Babies were hot collectibles. Hundreds of different animals were made, some in limited or special editions, some were “retired” and became hard to find. The Beanie Baby craze ended in 1999, when Ty Inc. stopped production. Now most old Beanie Babies are sold in “dump displays” at shows or in large lots at auction for about $5. Even rarities like Peanut the Elephant are selling well below the predicted price. Beanie Babies are back in the news because some online ads are offering buy-it-now Beanies for thousands of dollars – some for hundreds of thousands. A closer look shows no one is bidding or buying. Beanie Babies collectors with a stash in their closets have to take a moment and realize that a seller can list an item for any price at all, but that doesn’t mean their item will sell for an outrageous asking price. “Limited edition” became part of the collector’s vocabulary during the 1970s. At first plates, then figurines, then dolls, silver ingots and prints were promoted as limited editions, limited by quantity or period of production. It was a new idea that became a fad. Collectors saw prices of old editions rise, ads promoted “investment” possibilities, and many people bought large collections then were shocked in the 1990s when prices plummeted and the “investment” turned out to be a loss. The limited edition plate market became specialized by the 1970s. Clubs were formed and conventions were held so collectors could buy and sell older editions. Collector plates, Christmas plates and ornaments, anything Franklin Mint—dolls, coins, figurines and die-cast cars—Norman Rockwell merchandise, paperweights, figurines, bells, enamel boxes, spoons, mugs and steins have all been offered in limited editions. Once popular, many are now considered kitsch. They languish in closets, yard sales or resale shops and are very slow to sell. To have any value, the original box and paperwork must be included. Artist and illustrator, Samuel Butcher, began drawing pictures of endearing children in the 1970s. He and a friend began a small company to make and sell greeting cards and posters that featured his “Precious Moments” artwork and uplifting messages. In 1978, Enesco Corp. developed a line of porcelain Precious Moments figurines. Demand was high. Sales kept growing, too many different figurines were made, and the market crashed. Many buyers still love them but they sell for very low prices. At a recent charity auction, over 50 different figurines were offered at $10 each. Cabbage Patch Kids were created by art student Xavier Roberts, in 1978 and were one of the most popular fads of the 1980s. Roberts’ original dolls were handmade and he called them “Little People.” The Cabbage Patch Kids each had a cloth body, plastic or vinyl head and came with adoption papers. They had one-of-a-kind names and profiles. Later, the company was bought and many, many dolls were made. The early Xavier Roberts’ Little People dolls still sell for high prices. Most later Cabbage Patch dolls sell for $10 to $30 now. Thomas Kinkade (1958–2012) began selling his oil paintings of idyllic scenes in supermarket parking lots. He later mass-marketed printed reproductions and many licensed products (mugs, stationary, vases, books, etc. ), often using the limited edition plan, and characterizing himself as the “Painter of Light.” His prints were promoted with hard-hitting ads and direct mail. Too many franchised stores were opened. Thomas Kinkade died, prices of all Kinkade items dropped, but Kinkade paintings are still copied and sold, retailing for $350 and up. The handcrafted wood baskets made by the Longaberger Basket Company of Newark, Ohio became a hot collectible in the 1990s. The company issued expensive limited edition baskets, collectors got swept up searching for them, and prices went up. After a while, the resale market collapsed. Today there are low prices for even the most expensive baskets. They can be found at flea markets and online for under $40, a fair price for a basket wanted for its use. I have a Life Size Cardboard Advertisement of Singer Bobby Brown for Budweiser Beer with “ ITS A BUD THING “ wrote on it. I believe it from late 80’s or early 90’s. It was from a Liquor Store. I looked all over and can not find any information. Reading the comments above brings back a flood of memories about Beanie Babies, Boyd's Bears, and Cherished Teddies. To those of us who collected these for the pure joy of it,and never giving a thought to the secondary market, I'd say we came out ahead in the end. Whether picking out a new one or receiving one as a gift,it was always fun adding it to my collection. In regards to your recent information on Hummels, I never see the Pastel line, of which I have two. When it comes to collectibles, really, it's all about the love. We can't buy for speculated value -- that's the Dutch Tulip Mania redux. If heirs are expecting to profit from Grandma's collectibles they really need to think about storing it away for fifty years -- seems to take that long for things to become interesting again. I bought many comic books in the early to late 90's, NOT knowing that there a Comic book Bubble Mania going on. Now that I look back I remember them selling comic books on TV like they do knifes and coins. Comic book stores on every corner. Stan Lee later said that they were producing 5 million books for 250 thousand collectors, "It had to crash". I hear that collecting, as with most all things run in cycles. Can anyone comment any knowledge that you may have on Cycles, mainly collecting cycles. I was one who collected many full collections of Limited Edition plates. They are all still in the original packages with the paperwork, but I have no idea how to sell them. I am not au fait with eBay or the internet in general, and would appreciate any helpful suggestions. I have hundreds of these. I have never paid more than 50 cents each. When I sell a vintage doll through the internet I tuck one in with the doll for company on it's trip! While the collapse of their collectible value was probably predictable, my wife and I still have fond memories of Beanie Babies for somewhat personal reasons, and specifically the Teenie Beanie versions sold with McDonald's Happy Meals. At the height of the craze in 1998, your odds of getting one before they sold out were slim. At that same time, our son had to spend 6 weeks in Neo-Natal Intensive Care in Childrens' Memorial hospital in Chicago. It turned out that McDonald's was closely affiliated with CMH, including a nearby Ronald McDonald house, plus a McDonald's restaurant in the hospital that was only accessible by registered patients and their parents. It was a nice oasis of calm, there were Teenie Beanies everywhere to choose from, no fighting collectors; our son even had one in his incubator. Our son has grown up in perfect health, and to this day, finding a Teenie Beanie brings back fond memories for what was otherwise a stressful time.